Armament: One 0.303 inch (7.7 mm) forward-firing Vickers machine gun with a Constantinesco interrupter gear, one 0.303 inch (7.7 mm) Lewis gun on Foster mounting on upper wing and four 25 lb (11 kg) Cooper bombs, two under each lower wing, to be dropped in 2, 3, 4, 1 order. S.E.5: First production version. Single-seat fighter biplane, powered by a 150 hp (112 kW) Hispano-Suiza 8a piston engine. S.E.5a: Improved production version, powered by a 200 hp (149 kW) Hispano-Suiza 8b V-8 or 200 hp (149 kW) Wolseley Viper piston engine. S.E.5b: Experimental prototype, with semi-sequiplane wings, streamlined nose and retractable radiator. Only the prototype was built and it never entered production. Eberhart S.E.5e: About sixty S.E.5a were assembled from spare parts by American company Eberhart Aeroplane. These had 180 hp Wright-Hispano E engines and plywood-covered fuselages. The Royal Aircraft Factory S.E.5 was a British biplane fighter aircraft of the First World War. The first examples reached the Western Front before the Sopwith Camel. 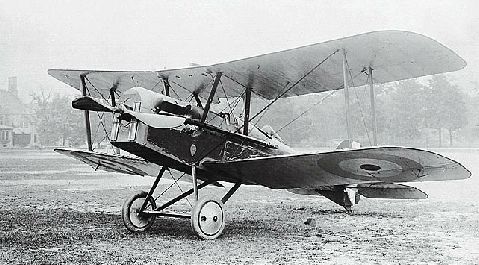 Although it had a much better overall performance than the Camel, problems with its Hispano-Suiza engine meant that there was a chronic shortage of S.E.5s until well into 1918 and fewer squadrons were equipped with the S.E.5 than with the Sopwith Camel. Together with the Camel, the S.E.5 was instrumental in regaining allied air superiority in mid-1917 and maintaining it for the rest of the war, ensuring there was no repetition of "Bloody April" 1917 when losses in the Royal Flying Corps were much heavier than in the Luftstreitkräfte. Only 77 original S.E.5 aircraft were built before production settled on the improved S.E.5a. Some pilots were initially disappointed with the S.E.5 but quickly came to appreciate its strength and fine flying qualities. It was considered to be underpowered but the more powerful S.E.5a was well received and began to replace the S.E.5 in June 1917. The S.E.5 was designed by Henry P. Folland, John Kenworthy and Major Frank Goodden of the Royal Aircraft Factory in Farnborough. It was built around the new 150 hp (112 kW) Hispano-Suiza 8a V8 engine that, while providing excellent performance, was initially underdeveloped and unreliable. The first of three prototypes flew on 22 November 1916. Weakness in their wing design caused the first two prototypes to crash. The first crash on 28 January 1917 killed Major F. W. Goodden, the chief test pilot at the Royal Aircraft Factory. The third prototype underwent modification before production commenced. The S.E.5 was known in service as an exceptionally strong aircraft which could be dived at very high speed. The squarer wings also gave much improved lateral control at low airspeeds. It was inherently stable, making it an excellent gunnery platform, but it was also quite manoeuvrable. It was one of the fastest aircraft of the war at 138 mph (222 km/h), equal at least in speed to the SPAD S.XIII and faster than any standard German aircraft of the period. While the S.E.5 was not as agile and effective in a tight dogfight as the Camel it was much easier and safer to fly, particularly for novice pilots. The S.E.5 had one synchronised 0.303-inch Vickers machine gun to the Camel's two but it also had a wing-mounted Lewis gun on a Foster mounting which enabled the pilot to fire at an enemy aircraft from below as well as providing two guns firing forward. Perhaps its greatest advantage over the Camel was its superior performance at altitude, making it a much better match for the Fokker D.VII when that fighter arrived at the front. The S.E.5a differed from late production examples of the S.E.5 only in the type of engine installed – a geared 200 hp Hispano-Suiza 8b, often turning a large clockwise-rotation four-bladed propeller, replacing the 150 hp model. In total 5,265 S.E.5s were built by six manufacturers: Austin Motors (1,650), Air Navigation and Engineering Company (560), Curtiss (1), Martinsyde (258), the Royal Aircraft Factory (200), Vickers (2,164) and Wolseley Motors Limited (431). A few were converted to two-seat trainers and there were plans for Curtiss to build 1,000 S.E.5s in the United States but only one was completed before the end of the war. At first, airframe construction outstripped the very limited supply of French-built Hispano-Suiza engines and squadrons earmarked to receive the new fighter had to soldier on with Airco DH 5s and Nieuport 24s until early 1918. The troublesome geared "-8b" model was prone to have serious gear reduction system problems, sometimes with the propeller (and even the entire gearbox on a very few occasions) separating from the engine and airframe in flight, a problem shared with the similarly-powered Sopwith Dolphin. The introduction of the 200 hp (149 kW) Wolseley Viper, a high-compression, direct-drive version of the Hispano-Suiza 8a made under licence by Wolseley Motors Limited, solved the S.E.5a's engine problems and was adopted as the standard engine. The S.E.5 entered service with No. 56 Squadron RFC in March 1917, although the squadron did not deploy to the Western Front until the following month. Everyone was suspicious of the large windscreens fitted to the first production models. These were designed to protect the pilot in his unusually high seating position, which was in turn intended to improve vision over the upper wing. The squadron did not fly its first patrol with the S.E.5 until 22 April, by which time, on the insistence of Major Blomfield, 56 squadron's commanding officer, all aircraft had been fitted with conventional, small rectangular screens. The problem of the high seating position was solved by simply lowering it, pilots in any case preferring a more conventional (and comfortable) seating position. No complaints seem to have been made about the view from the cockpit; in fact this was often cited as one of the strong points of the S.E.5. At this time 56 Squadron was still the only unit flying the new fighter; in fact it was the only operational unit to be fully equipped with the initial 150 hp S.E.5 – all other S.E.5 squadrons officially used the 200 hp S.E.5a from the outset – although a few S.E.5s were issued to other squadrons due to an acute shortage of the S.E.5a. This shortage resulted in a very slow initial build-up of new S.E.5a squadrons, and lasted well into 1918. Once the Wolseley Viper-powered model became plentiful many more units re-equipped, until by the end of the war the S.E.5a was employed by 21 British Empire squadrons as well as two U.S. units. Comfortable, with a good all-round view. Steady and quick to gather speed in the dive. Capable of a very fine zoom. Useful in both offence and defence. Strong in design and construction. Some S.E.5s remained in RAF service beyond WW1, but began to be withdrawn soon afterwards. Service continued for a time in Australia and Canada, and in 1921 a Viper-engined S.E.5a was taken to Japan by the British Aviation Mission to the Imperial Japanese Navy. A number of machines found roles in civilian flying after the war. The first use of skywriting for advertising was on 30 May 1922, when Cyril Turner, a former RAF officer, spelt out "London Daily Mail" in black smoke from an S.E.5a at the Epsom Derby. Others were used for air racing, one winning the Morris Cup race in 1927.